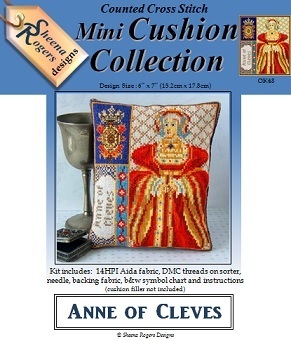 Stitch a slice of Tudor history with this mini cushion design of Anne of Cleves, Henry VIII's fourth wife. Henry VIII had not met Anne prior to their betrothal. He chose Anne to be his wife from her painted portrait but was disappointed when meeting her in the flesh. Unfortunately for Anne, the wedding between her and Henry would form an alliance with the House of Cleves intended to bring political support and power in Europe that Henry craved, and so had to go ahead. Anne of Cleves was 24 years old when she married 48 year old Henry in January 1540, but their lack of chemistry plus their separation by language, culture and personalities resulted in their marriage being annulled 6 months later. This triptych design features a portrait of Anne, set against a tapestry-style background, with a second panel of Anne's badge (being a gold escarbuncle, which is a symbol of supremacy, and takes the form of a shield with iron bands radiating outwards from the centre to help strengthen it for battle) plus a third panel with her name and a mini Tudor Rose border.